We held two fringe events at the Local Government Association (LGA) conference earlier this month, where we invited local and national political leaders and others to debate the value of devolving power to communities. At Local Trust we believe that supporting people to come together and improve their communities can build social capital, maximise resources and foster community cohesion. And at our LGA fringe events, there was consensus that devolution from Whitehall shouldn’t just stop at the town hall. Participants also acknowledged that devolving more power to communities is easier said than done, and that it takes time and resources. 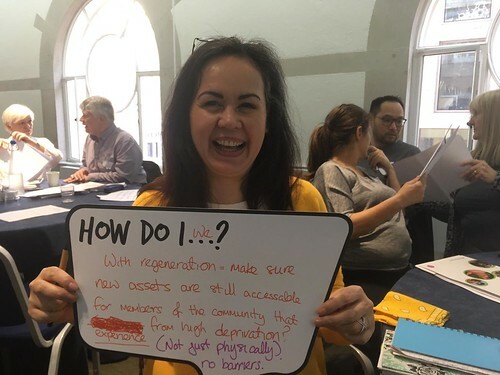 By sharing what we heard and learned at the conference, and drawing on examples from Big Local, we want to inspire more debate and encourage public services to take their first steps towards ‘devo max’. That’s also why we’re proud to sponsor the Community Collaborator category in the annual C’llr Awards run by the Local Government Information Unit. If you know a councillor who is pioneering new methods of community support and engagement and empowering residents to lead positive local change, nominate them today (closing date is 22 August). Here are our eight fringe ‘takeaways’ – you can read more about them, and access examples of council-community collaboration in action, in our fringe findings report. It’s a way for councils to build trust with their communities, so you can co-create, involving them in tough choices and public service reform, while providing a sense of purpose. Early findings of long-term research by the National Institute for Health Research (NIHR), shared by our fringe chair and Local Trust chief executive Debbie Ladds, showed that communities who are given the opportunity to create lasting change report growing confidence in people’s ability to believe things can change. We heard many examples of service users becoming involved in commissioning, procuring, designing and managing services – like the tenant management board at an estate in Brixton who hold the housing repair staff to account and have the power to end contracts if they don’t think services are up to scratch. Local authorities sometimes complain of finding themselves responsible for more services, but without sufficient resources to provide them. Everyone at our fringe events agreed on the importance of not inflicting a similar situation onto our communities. In Big Local, because each community decides for themselves what to tackle, narrow thematic indicators don’t allow effective measurement. In Big Local, we use a range of methods to show the changes communities are bringing about. These range from deep-dives into areas to surveys of the wider community and, crucially, reviews the communities do for themselves. Our learning from Big Local is to provide support where it’s needed, while leaving people room to learn for themselves. Click to download PDF of our full fringe findings. If you’d like to sign up for occasional email updates on collaboration with communities, email us.